Where koalas are able to live in undisturbed forests free of human interference, the colonies tend to be much healthier and do not suffer the diseases and problems that koalas face that live at the human/bush interface such as urban and rural areas. Like other native animals, they are prone to stress. A common disease is a bacterial disease called Chlamydiosis. 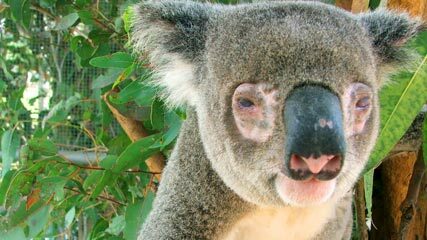 This bacterium can affect the eyes of the koala and/or the urogenital tract. Koalas mask their illnesses very well – sick koalas are very sick koalas. Chlamydia commonly causes ocular and urogenital disease manifested by keratoconjunctivitis (pink-eye), infertility and urine staining of the rump caused by cystitis (dirty tail). Secondary infections, with other bacteria and fungi, is exacerbated by a number of factors including chronic stress, poor nutrition and immunosuppressive diseases. The weaker animals succumb to the disease, become sick, infertile or die, leaving the genetically stronger animals to continue breeding. Chlamydia is stress related. Symptoms can extremely painful, highly contagious to other koalas and life threatening if left untreated. Koala numbers had dropped dramatically in Queensland, New South Wales and the ACT over the past 20 years. The Australian Koala Foundation states that chlamydia may serve as an “inbuilt control mechanism” that helps limit koala population and to ensure only the strongest of them will survive to reproduce. With numbers severely compromised, and added stress from today’s contemporary threats, it could “control” to extinction. Last year, researchers from Queensland and New South Wales published a study recommending that koalas be culled in the name of conservation. The study found that, to grow the Koala Coast population, around 10% (or 140 individuals) of koalas would need to be captured and culled or treated each year. Culling to stop the spread of disease is controversial, and not always successful. The koala is the only native Australian species for which culling has been consistently dismissed as a management option. Lead researcher Professor David Wilson said in some areas, over half the koala population had the chlamydia disease. Given its rate of spread, and considering how painful and debilitating the condition is for koalas, some conservationists are calling for a massive cull in order to get the disease under control as researchers feverishly work on a vaccine. It’s a bit like surgeons performing a successful operation, but the patient died! It’s a Pyrrhic victory, of killing the host animal to kill a disease. 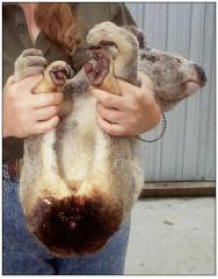 In 1997, culling was proposed as a component of an integrated strategy to manage high density populations of koalas on Kangaroo Island, but it sparked much outrage and ultimately led to a decision at the Commonwealth level that culling will not be considered for management of koalas. Scientists at the University of the Sunshine Coast said they had successfully vaccinated koalas against the disease, which was responsible for about 50 per cent of the marsupial’s deaths. A vaccine trial involved 60 koalas from the Moreton Bay region, with 30 koalas given the vaccine and 30 koalas used as controls. Those given the vaccine showed good immune responses with overall infection rates decreased. The vaccine is currently the newest and most advanced vaccine composition in existence and the Australia Zoo Wildlife Hospital hosted the world-first administration of the new version. It was the first full medical trial following a smaller test that took place in Lismore last year – building on efforts over the past seven years to develop a successful vaccine for koalas. Redland City Mayor Karen Williams said Council had provided $30,000 to the joint University of the Sunshine Coast and Australia Zoo Wildlife Hospital trial aimed at finding a vaccine to fight devastating chlamydia disease. Flann the koala at Australia Zoo was the patient who received the injection of the new vaccine and will be the first of a study of 30 animals in the ground-breaking trial.